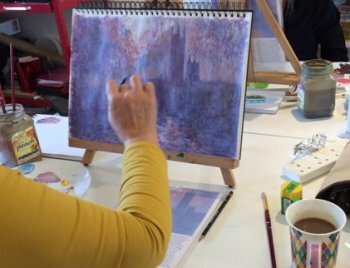 In this one-day workshop we will have fun with colour and take inspiration from the Impressionist painter Claude Monet. 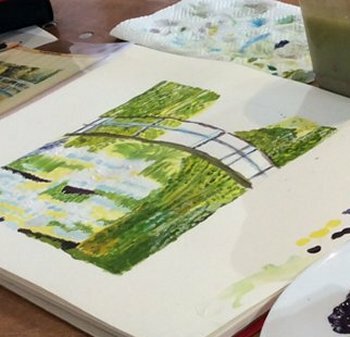 Working with acrylic paints, students will learn how to paint in an impressionistic style. We will cover aspects of colour theory, brush control and impressionist techniques. In the morning we will work closely from photographs of one of Monet's paintings, painting on a primed, stretched canvas. After lunch we will use these skills and techniques in compositions of our own! All materials provided, including a small canvas and multimedia paper! An opportunity to make creative new friends! This class is led by Clare Tebboth - a professional artist and qualified teacher. Clare works in a variety of mediums in her home-based studio and teaches a number of highly-rated art classes at Vitreus Art. 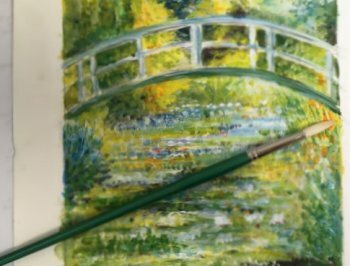 After enjoying this class you may like to consider joining Clare's 5 or 6 session painting and drawing course, covering a different subject or method each week, held on Friday mornings or afternoons. Or Clare's Wild with Watercolours may inspire you! 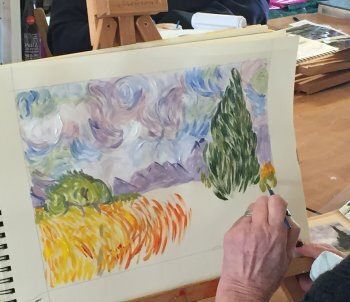 Paint Your Own Monet Masterpiece takes place at Vitreus Art @ Wakefield, 5 miles north of Milton Keynes on these dates; class runs from 10am to 4pm. If you're ready to book, use the PayPal button below and select the session you want to join - debit / credit cards and PayPal accepted . We can also take personal bookings in our studio. If you'd like to receive our monthly newsletters with updates on new class dates and types, plus all sorts of art, craft and stained glass information, click here and subscribe. Clare works predominantly in oils, her loose style making use of both brushes and palette knives. She enjoys the richness of oil paint and the luxurious finish it gives to paintings. Having grown up in Norfolk and enjoying frequent childhood trips to windswept beaches, her work is often based around the sea and the special mood that a wintry beach creates..
Clare has 19 years experience in the classroom teaching and has developed a reputation for fun and stimulating adult art workshops. 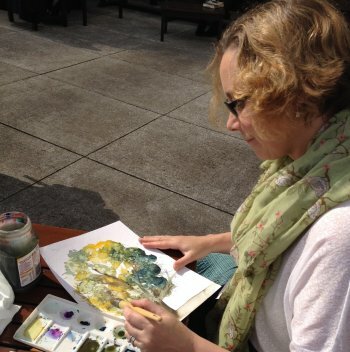 Clare welcomes commissions and enjoys working with clients to create unique pieces of artwork. She is a Member of the Society of All Artists and Chair of Buckingham Art for All. Oscar-Claude Monet ( 14 November 1840 – 5 December 1926) was a founder of the French school of Impressionist painting. From 1883 Monet lived in Giverny, where he bought a house and property and began a vast landscaping project which included lily ponds that would become the subjects of his best-known works. Crucial to the art of the Impressionist painters was the understanding of the effects of light on the local colour of objects, and the effects of the juxtaposition of colours with each other. Monet's long career as a painter was spent in the pursuit of this aim.